A memorial is being unveiled to a World War I hero, who was known as the "Lost Victoria Cross" because his grave was unknown for 50 years. 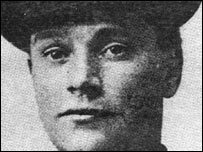 L/Cpl Alfred Wilcox, from Birmingham, won the VC for his bravery in killing 12 enemy soldiers in 1918 but was forgotten after his burial in 1954. A memorial is being unveiled in Aston Parish Church graveyard after his grave was finally traced. His family said it would mean his "exceptional bravery" would live on. The soldier with the Oxford and Buckinghamshire Light Infantry was the only Victoria Cross winner whose exact resting place was unknown. He was given the highest military honour for "conspicuous bravery" capturing four machine gun nests almost single-handedly in the trenches at Laventie, France, in September 1918. After all but one of his group was wounded in no man's land he rushed the first machine gun, bombing it with grenades to kill the gunner and capture the position. Seeing off an enemy bomb attack he went up the trench and in a hand fight bayoneted a second gunner to take the next gun before bombing a third position killing five of the enemy. After his own gun became clogged with mud he carried on to capture a fourth gun nest using enemy stick bombs. In all he killed 12 men, saving the lives of countless British soldiers who had become pinned down by the enemy guns. He was later injured and discharged from the army in 1919, receiving his VC at Buckingham Palace that November and was congratulated by the Lord Mayor of Birmingham at a public celebration in Victoria Square. He was buried in an unmarked grave at Aston Church in 1954 but no records exist giving the location of his grave. Local historian Chris Sutton took on the challenge to solve the mystery a year ago, eventually tracing Alfred's nephew, John Wilcox, who was at his uncle's funeral and could locate the grave. More than 50 members of his family and former serviceman, along with regimental association chairman Gen Sir Edward Jones, are holding a service of dedication at the memorial on Tuesday - 88 years to the day since his heroic action. "It was an incredibly brave thing that he did and it was wrong he was just left there," said Mr Wilcox, 75, a novelist who lives in Salisbury, Wiltshire. "This brings closure at last, the mystery of The Lost VC is finally solved. "His six brothers all fought in the trenches and this will bring some recognition to all the boys of the family, and hopefully people in the locality will know a bit about him," he said. 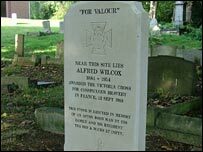 Mr Sutton said: "Many VC winners aren't recognised but Alfred Wilcox was one of the worst because no-one even knew where he was buried. "This shows we recognise and are proud of one of the great sons of Birmingham, someone who has done this great thing but had been forgotten about."